Well, I was in Viena and Bratislava this weekend and I saw beauty center Nefertiti, and queen is depicted on the door. I have a great time. My favourite statue would be the statue of Rahotep and Nofret - a couple of 4th dynasty, son and daughter-in-law of Snefru. @ Hathorhotep, the statues of Rahotep and Nofret are indeed real pearls and very lifelike. They show also very much detail. You are talking to me! I am still dead from the trip. And how are you Toth? Did Ra spred his light over you this morning when Sopdet apeared on the sky? Is Sopdet Venus? No... the page is in croatian, so language is not the problem. But I am drunked... I think I have no idea what I am writing here. Where is Anneke? When they first time opened Rahotep's mastaba, they ran away because statues were so lifelike. You know this? O Ra, save me! Hathorhotep, yes, why shouldn't I that was a great post! Ra was behind the (snow) clouds this morning, Croatian may not be a problem to you But it is to me. You are drunk? What did you drink, wodka? I think Anneke is at home, it's still very early there. The Mastaba of Mereruka is the largest and most elaborate of all the non-royal tombs in Saqqara with 33 rooms or chambers in total. Mereruka was the vizier to king Teti, who was the first pharaoh of the 6th dynasty Old Kingdom period of Egypt. Mereruka was also married to Teti's daughter, princess Hert-watet-khet. He was, therefore, the king's son-in-law. 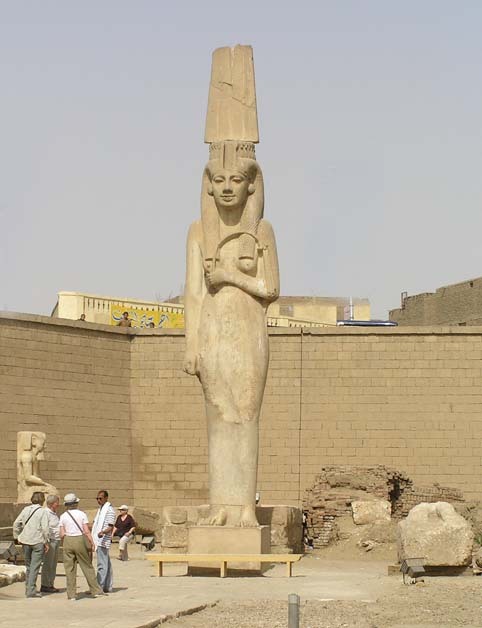 Princess Hert-watet-khet is buried in Mereruka's mastaba tomb along with their son, Meriteti. The paintings on the wall in the entrance of the tomb show Mereruka painting the seasons and playing a board game. The first three chambers are decorated with scenes of furniture making, hunting and goldsmith working. A life-like statue of Mereruka was found intact within the principal chamber at the far end of his mastaba tomb. This chamber is approached through the mastaba tomb's false door. Mereruka's mastaba tomb boasts vibrant and well preserved tomb decorations and numerous relief scenes. His mastaba tomb remained hidden from view until it was discovered and excavated by Jacques de Morgan, of the Egyptian Antiquities Service in 1892. However, the first major publication on his tomb did not occur until over 40 years later in 1936 by Prentice Duell. Mereruka was also known by his 'beautiful' or chosen name of Meri. Twenty-one of the mastaba chambers are devoted to Mereruka himself, five are designated to his wife Hert-watet-khet (chambers B) and five were added for his son Meriteti (or Meryteti) (chambers C). The overall external dimensions of Mereruka's mastaba are 23 metres east-west, 30 metres north-south (extending to 41 metres when one includes Meriteti's addition) and 4.5 metres high, while the internal height of the ceiling is just over 4 metres. Princess Hert-watet-khet's complex at the left end of the tomb entrance to Mereruka's tomb depicts her "receiving offerings due to a king's daughter, including a selection of finely carved furniture" while she is shown relaxing and watching several dancing girls. In another scene, "she is portrayed with her three dogs and a pet monkey." On the walls of chamber 7, Princess Hert-watet-khet is shown sitting together with Mereruka "on a large couch, while she plays her harp to soothe him." While most of the rooms of Mereruka's mastaba tomb were decorated, those which were left bare was simply used for storage. A hunting scene within Egypt's marshes from Mereruka's tomb show five men punting "a papyrus raft along a verdant Nile bank, packed with reeds and teeming with wildlife" while nesting lapwings are depicted protecting their young from a marauding ichneumon, or type of mongoose, by either "spreading their wings over their chicks or by mobbing the intruder." In the Nile river, one adult hippopotamus is shown seizing and killing a basking crocodile, "while behind it another crocodile turns the tables, waiting to devour a newborn hippopotamus." Other scenes show sculptors and carpenters of stone vases at work, while Mereruka and his wife are depicted inspecting a jeweller's workshop where some of the workers are dwarfs . Oh my goddess, save me! Wodka is the best! I think Khufu would agree with me. Mereruka is great. I love it. I wanna see him. And one day I will. Isn't it funny that they all on that photo seem to have that posture (or am I looking at multiple images of the same person? You are looking at multiple pictures, the figures on the left and right show also Mereruka, in the presence of his wife and daughter or wives(?). Meritamun is no langer alone at Akhmin`s Open Air Museum. Her father makes her company again : " RAMSES II STATUE IN SOHAG RECONSTRUCTED " (Ministry of Antiquities - Facebook, 06.04.2019).